One reason I have been puzzled and disappointed by the negative response to "biologists winning the chemistry Nobel Prize" is that the biologists who are the target of criticism have almost always been protein crystallographers. It's not like they are handing out chemistry prizes to entomologists or animal behaviorists. The response is especially puzzling because there's always been a proud tradition of crystallographers winning the chemistry Nobel Prize. In my reading of Nobel history I haven't really come across someone criticizing this trend; in fact I have seen the complaints emerge roughly in 2006 or so, when Roger Kornberg was recognized for his work on the machinery of transcription. 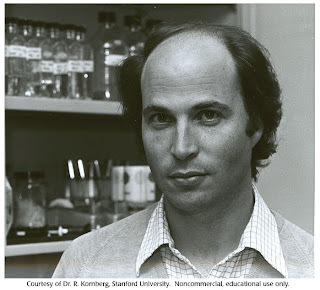 Ironically, Kornberg himself in his Nobel interview praised chemistry as the "queen of the sciences" and even went to the length of saying that if an intelligent person could familiarize himself with just one science, it should be chemistry. Not surprisingly, Kornberg emphatically described himself as a chemist and chemists should proudly count him as one of their own. And yet the gripes keep coming which is unfortunate. Let's be clear about one thing that Kornberg alluded to. Traditionally, the determination of molecular structure has always been a profoundly important concept in chemical science. Synthesis and function come next, but first one has to know the structure of the substance under investigation. A large part of the history of chemistry thus consists of organic chemists determining the structure of natural products, first through chemical degradation and then through increasingly sophisticated spectroscopic techniques including x-ray diffraction. The ribosome, GPCRs, ion channels and nuclear receptors are giant molecular assemblies, and the meticulous determination of their atomic-level structure is in principle no different from the structure determination of penicillin, aspirin or sodium chloride for that matter. Largely for my own private elucidation but also to make this point clear, it's worth pointing out the list of crystallographers who have been awarded chemistry Nobel Prizes and their achievements. Most of these prizes have been awarded for specific structures but some have been awarded for methods, thus putting these prizes in the same category as those for NMR and mass spectrometry. 1954: Linus Pauling - Although Pauling is best known as a theoretical chemist, much of his most important work was in crystallography. At the beginning he used electron diffraction to resolve the structures of simple minerals and developed rules to describe their packing. Later he used crystallography to deduce the famous alpha helical and beta pleated sheet secondary structures of proteins. 1962: Max Perutz and John Kendrew - the fathers of modern protein crystallography, awarded the prize for their structure determination of two key proteins, hemoglobin and myoglobin. Perutz labored over the structure for fifteen years before cracking it and set the trend for every persistent crystallographer who was to follow. 1964: Dorothy Hodgkin - for her determination of the structures of important biochemical substances such as vitamin B12 and penicillin. Most chemists even today would place this work in the realm of chemistry. 1982: Aaron Klug - Klug developed crystallographic electron microscopy techniques to study many key biochemical assemblies like the tobacco-mosaic virus and chromatin. 1985: Herbert Hauptman and Jerome Karle - Hauptman and Karle formulated mathematical techniques for the direct interpretation of x-ray diffraction patterns which addressed the notorious "phase problem". This work was very much in the spirit of physics, and was the first prize awarded for diffraction methods. It's again worth noting that similar prizes were awarded for NMR and mass spectrometry methods and there was not a sound from chemists. 1988: Johann Deisenhofer, Robert Huber, Hartmut Michel - This prize was awarded for cracking open the structure of one of the most important proteins on the planet - the photosynthetic reaction center which captures light and performs the initial reactions in photosynthesis. This was also the first integral membrane protein to be crystallized, a huge technical achievement. 1997: Paul Boyer, John Walker and Jens Skou - Again, a prize awarded to an important and truly fascinating protein and the first molecular motor, the Na+ K+ ATPase. This discovery also shed light on the crucial process of ATP synthesis. 2003: Peter Agre and Roderick McKinnon - Another key protein, they just keep on coming. This time it was the potassium ion channel, the nerve center (pun) of ionic conduction, muscle action and neurotransmission among other processes. 2006: Roger Kornberg - Kornberg dissected the fundamental process of DNA to RNA transcription in meticulous detail over two decades. The work involved pinning down the positions of dozens of proteins assembled in a precisely orchestrated circus. 2009: Venki Ramakrishnan, Tom Steitz and Ada Yonath - Another molecular machine of profound importance - the ribosome. Not only did the fearsome structure of this gargantuan assembly of proteins and RNA yield to crystallography but it also validated one of the most startling and significant observations in the history of biochemistry - the ribosome is a ribozyme. 2011: Dan Shechtman - Caused a paradigm shift, albeit not in protein crystallography. Interestingly chemists were lukewarm even about this prize, relegating it to metallurgy or even physics rather than chemistry. 2012: Robert Lefkowitz and Brian Kobilka. A few observations. There have been a total of 11 Nobel Prizes awarded since 1954 to x-ray crystallographers. That's not a lot and certainly nothing to complain about. There's of course more awarded to biochemists in general, but even there the count is 24 prizes since 1950. The crystallography prizes seem to become more frequent as we approach the 90s and the twenty-first century, and the reason is probably that the technology and methodology made it finally possibly to tackle the structures of fundamental entities like the ribosome and ion channels which couldn't be addressed before. It's also important to emphasize that each one of the protein structures provided insight into an important physiological process which involved a lot of actual, bond-breaking and bond-making, chemistry. It's natural for a chemist to lament his favorite field, reaction or molecule not winning a prize but the truth is that this reflect a provincialism that ignores chemistry's immense reach. What's the future going to look like? Nobody can say for sure, but the increasing number of prizes awarded to biochemists and crystallographers since the 80s seem to indicate that this trend will continue, with prizes awarded even more frequently to protein crystallographers and molecular biologists. And this shouldn't be surprising. We are finally at a stage when we can use the full set of physical and chemical tools at our disposal to tackle the big biological and medical questions of our time. Chemistry through its use of structure determination techniques and small molecules will allow us to interrogate the function and find out the structure of increasingly complicated biological assemblies. But the take-home message is that any future chemistry Nobel Prizes awarded to "biologists" will only showcase the growing power of chemistry and spectroscopy to uncover life's deepest secrets. Synthetic and systems biologists for instance are just getting started in engineering cells and organisms and even that is chemistry. The location of the essence of biological existence in life's constituent molecules was one of the most revolutionary discoveries of all time. It seems fitting that this paradigm will shine in all its glory in the twenty-first century. Rather than resign themselves to what they see as an inevitable fate, chemists should celebrate this development as the ultimate manifestation of the power of chemistry in illuminating structure and function. Thanks Magnus, don't know how I forgot that one! FYI - the photosynthetic reaction center (1988; Deisenhofer, Huber, & Michel) was also the first integral membrane protein whose structure was solved via x-ray crystallography to reasonably high resolution. I have additional thoughts, but still compiling them into a more-or-less coherent whole. Good point, let me update the post. You left out the most important: Watson, Crick, Wilkins in 1962. And before you say they weren't crystallographers (Wilkins was), Crick identified that DNA helix was anti-parallel, which Rosalind Franklin missed! Yes, of course I remembered Watson and Crick, it's just that I was thinking of the chemistry Nobel Prize. As you point out, Crick was very much a crystallographer. Elucidating the structure of DNA was the chemical problem of the CENTURY. That's why Watson and Crick (neither of whom were chemists) pursued it. See Horace Freeland Judson's 'The Eighth Day of Creation' for background/context. The fact they won for Medicine and Physiology is an artifact of the Prize itself. Although x-ray crystallography is a great analytic tool and many advances have ensued, it is now in the area of R&D, not fundamental research. Similarly, NMR is a great tool for science and both came from fundamental research. NMR evolved from trying to find out if a proton spin would resonate. I worked on theory of NMR until 1997 and gave up because the technique is understood. Although there are great applications of these techniques, the instrumentation will only improve without new fundamental changes. Therefore I do not believe prizes should go to those techniques, only to those who discover something that is verified by those results. Yes, x-ray crystallography has done a lot for us, as has NMR, but these are now techniques and not areas of fundamental development.